This is a Portuguese name; the first family name is Egas and the second is Moniz. 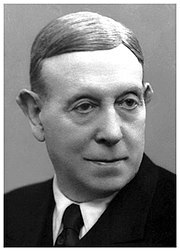 António Egas Moniz (António Caetano de Abreu Freire Egas Moniz, 29 November 1874 – 13 December 1955), known as Egas Moniz, was a Portuguese neurologist. He developed cerebral angiography, a technique to visualise the blood vessels in and around the brain. This technique is widely used today. He also developed the surgical procedure leucotomy, also known as lobotomy. This technique is now rarely used. Antonio Egas is highly regarded. He became the first Portuguese national to receive a Nobel Prize when, in 1949, he shared it with Walter Rudolf Hess. ↑ "Comments by Carl Skottsberg, President of the Royal Academy of Sciences (Sweden), Nobel Medicine Prize Banquet 1949". Retrieved 2009-12-02. This page was last changed on 21 February 2019, at 00:11.